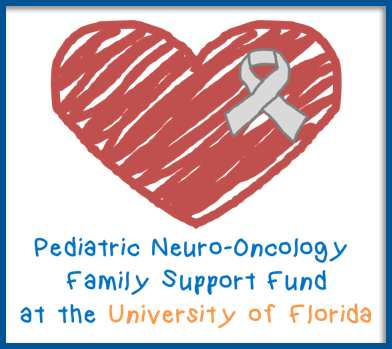 All Neurological Surgery physicians at the University of Florida treat patients with carpal tunnel syndrome. 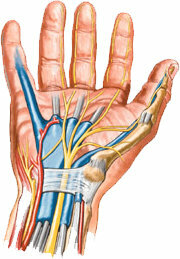 Three nerves (median, ulnar and radial) supply sensation and promote movement of the hand. 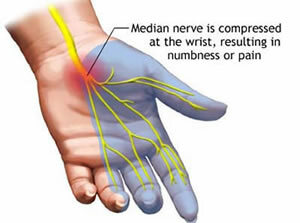 The median nerve, arising from multiple nerves of the spinal cord, travels along the middle arm and forearm through the wrist and into the hand. This nerve passes though the wrist in a tunnel known as the carpal tunnel. Numerous tendons that control finger movement form the base and walls of the carpal tunnel. A broad fibrous band, the transverse carpal ligament, forms the tunnel roof. With thickening of this ligament the median nerve can be compressed in this tunnel causing pain and numbness in the hand. Risk factors for carpal tunnel syndrome include repetitive movements of the wrist in certain jobs such as assembly line work or typing. Retained fluid or soft tissue swelling can cause median nerve entrapment in pregnancy, diabetes, rheumatoid arthritis, degenerative arthritis, lupus, and trauma. Endocrinologic causes of carpal tunnel syndrome include acromegaly and hypothyroidism. Other disorders that may cause similar pain are cervical spine disease, brachial plexus injuries and other peripheral nerve problems. Patients may complain of tingling or “pins and needles” in their fingers and hand, most significantly in the thumb, index and middle fingers. Sensory loss and a burning sensation are also commonly reported. Pain may radiate up into the arm. Often patients notice difficulty with fine motor movements. Eventually, there is wasting of the muscles in the hands. Many times symptoms are worse at night. The diagnosis of carpal tunnel syndrome involves and neurological history and physical examination and diagnostic electrical studies. Tapping over the wrist (Tinel’s sign) or placing the hand in a flexed position (Phalen’s sign) may reproduce the tingling or pain. Wasting of the hand muscles may be seen as a late sign. Electromyography (EMG) and nerve conduction studies (NCS) are done to confirm the diagnosis. Conservative treatment involves a extension wrist splint and the use of non-steroidal anti-inflammatory pain relievers. Many patients will have significant improvement with medical management. Steroid injections may also be helpful. Patients who fail conservative therapy and those with severe symptoms may be candidates for surgical decompression. This surgery is typically performed under local anesthesia with intravenous sedation. A one inch incision is made in the palm over the carpal ligament. 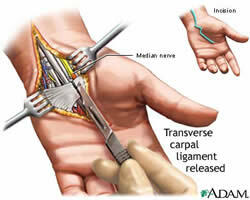 The soft tissue is dissected to the level of the ligament and it is cut to relieve the pressure on the median nerve. This surgery is a short outpatient procedure with a very high success rate.